"flow of reaction" Haus der Kulturen der Welt, Berlin: Maite Cajaraville ("flux of influences") and Nils Bonde ("never had hair on my body or head") | "art cologne", Köln: Alba D´Urbano ("hautnah" presented by Galerie Anita Beckers), INM (multimedia presentation of Galerie Anita Beckers) | "Ars Electronica", Linz: Gerd Döben-Henisch and assistants of the INM ("Blind s World One") | "Art", Zürich: Alba D´Urbano ("hautnah" presented by Galerie Anita Beckers), INM multimedia presentation of Galerie Anita Beckers) | "Design Horizonte", INM Frankfurt: Gerd Döben-Henisch ("Knowbotic Interface Project"), Michael Klein ("Digital Location Frankfurt") | "Biennale", Venedig, Austrian Pavillion: Peter Weibel (Kommissar Austrian Pavillion), Constance Ruhm ("Kanal") | Lindenau Museum: Christa Sommerer, Laurent Mignonneau and the INM ("Phototropy") | "Telepolis", Luxemburg: Gerd Döben-Henisch ("Blind s World Two"), Bernhard Franken ("Skylink"), Nils Bonde ("Market Economy for beginners"), Alba D Urbano ("Entwurf der Telepolis Ausstellungsarchitektur") | "Kunst-Chaos-Medien", Galerie der Stadt Sindelfingen: Institute exhibition with 21 works of the INM artists| Kunstverein Frankfurt: Maite Cajaraville ("Videoportraits") | "Weltbild Wörlitz", Deutsches Architektur Museum, Frankfurt: Nicolas Reichelt ("Virtueller Spaziergang durch die Wörlitzer Anlagen") | "Der Faden", Kunstverein, Celle: Alba D'Urbano and Nicolas Reichelt (media art project of the working complex "Rosa Binaria") | "9. Videofest", Berlin: The Institute for New Media (multimedial presentation) | "Animierte Grafik", Portikus Frankfurt: Thomas Bayrle ("Superstars") | "Int. Kongreß für Semiotik", Amsterdam: Gerd Döben-Henisch ("Semiofic Machines") | "World Class Business 2000", ICPG London: Michael Klein ("Opportunities Afforded by Advances in Media Technology and Networking for Consumers and Business") | "DEAF", Rotterdam: Bernhard Franken ("Skylink: Hypertecture") | "11. Europ. Symp. QSAR", Lausanne: Michael Klein ("Complex Systems: On the Simulation of nature and the nature of Simulation") | V2 Rotterdam; Michael Klein ("INM-Institut für Neue Medien") | "Infoarchitectura", Madrid: Nicolas Reichelt ("3-delight") | Kunstverein Wiesbaden: Cornelia Franke ("Chambre separee") | "Art Cologne", Köln: Alba D'Urbano ("Il Sarto Immortale", presented by Galerie Anita Beckers) | Museum für Moderne Kunst, Frankfurt: Thomas Bayrle | Kunstverein, Wiesbaden: Alba D´Urbano ("Il Sarto Immorfale", presented by Galerie Anita Beckers) | Roomade, Brüssel: Kobe Matthys ("Agency") | "Frankfurt meets New York", Whitney Museum: Michael Klein, Thomas Bayrle (presentation) | 11. 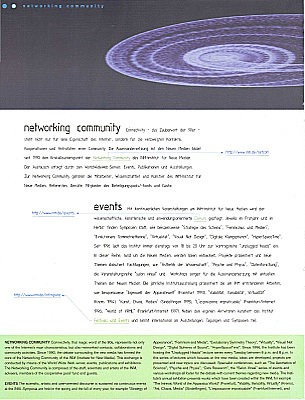 Transmediale, Berlin: Constanze Ruhm ("Neue Arbeiten"), Thomas Bayrle ("Rasterfahndung"), Nicolas Reichelt ("World of VRML") et al. The evolution of complex technologies recentlyspawned the field of new media. The main progress was made in the area of manipulating information. Chemical data storage like photo and film only store a frozen image of reality whereas electromagnetic storage allows unlimited changes. Digital TV, digital video, multimedia computers and data networks are all based on the processing of digital information. Pictures and sounds merge into simulated model worlds of new media. The juxtaposition of simulated model worlds and the external world happens via the human-machine-interface. Interactive new media integrate the human observer as a conditio sine qua non. Traditional as well as biosensoric interface technologies produce a multisensorial juxtapositioning of the worlds. Mouse, keyboard, tracking systems or neurochips unlock the computer generated interactive scenarios. The submersion into these synthetic worlds the virtual immersion enables the human user to enter new areas of experience and new worlds never seen before. The world wide web as the most interesting internet user interface for now combines text, graphics, images, audio and video with the navigational elements of the internet matrix. 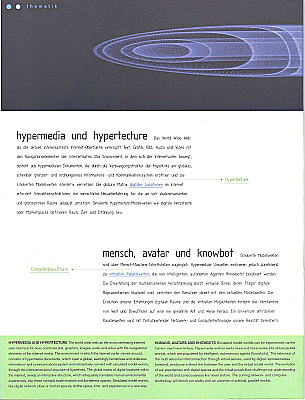 The environment in which the internet surfer moves around consists of hypermedia documents which open a global seemingly borderless and orderless information- and communications-system and interactively connect with simulated model worlds through the interconnectional structure of hyperlinks. The global matrix of digital locations within the internet needs an interactive structure which adequately translates human environmental experiences into these normally scale invariant and borderless spaces. Simulated model worlds like digital network cities or market spaces define space, time and experiences in a new way. Simulated model worlds can be experienced via the human-machine-interface. Hypermedia environments more and more evolve into virtual parallel worlds which are populated by intelligent, autonomous agents [knowbots]. The extension of the multi sensorial interconnection through virtual senses used by digital representatives [avatars] produces a direct link between the user and the virtual model world. The evolution of our experiences with digital spaces and the virtual possibilities challenge our understanding of the world and consciousness like never before. The coming network- and computertechnology will enrich our reality with an universe of artificial, parallel worlds. Interactive simulated model worlds, which can be interlinked via the internet more and more revolutionize social scientific and economic discourse. What it shows is that this is not only a technological improvement of computers but - due to the enormous increase in computational capacity - a qualitative leap towards the computer as a universal space time simulator. The established understanding of space and time as well as the ideal of analytical - empirical science are challenged by the virtual extensions of the experimental spaces. The computer as a world generator works as a explorational tool and implements a new perspective as well as scientific methods. The simulation of complex, especially non-linear systems are by definition analytically not understandable. The enormous amount of data generated by computer experiments need to be visualized. Visualizations are neither objective nor independent of the observer.The process is marked by a turn towards the visual. This historical shift to the visual merges science and media art. Media art defines the new scenarios of the simulated model worlds as multisensorial experiential fields in which the interactive observer as a part of the art-installation enters an individual experimental world through the interface as through a door. Scientific research in the visual environment of simulated model worlds needs a new method, which complies with the demands of the virtual realities. Observation is an essential part of numerically visualized model worlds of dynamical states and objects. Using appropriate interfaces real and simulated worlds of imagination can be interconnected. Only all three elements together - simulated model worlds, real space with interfaces and we the observers - define the interactive state and constitute the possibilities of new media. Therefore the interface aspect of the man-machine System changes from a technical towards a conceptual problem. The entaglement of worlds of imagination challenges the classical discoupling of observer and object through the introduction of an individual observer. This system internal, subjective observer transforms from recipient into interactor. Instead of the fear of too many possibilities the exploration of transformations of individual representations is central to digital science and media art. The possibilities of new media demand a reevaluation of the core terms and concepts of space and time. The entity of interactive media art installations as well as scientific simulations is binary information. Objects exist in virtual address spaces of electronic machines or in the digital network matrix. Their reality is virtual. The states are variables in the space-time grid and are almost totally available for algorithmic manipulations. Their stabitity is variable, causal correlations can be defined and scaled freely. Basal time patterns change. On the one hand simulations help us to realize that states of complex dynamical Systems have a development in time and historicity through which the problem of ergodicity contrasts with the reproducibility of the classical scientific ideal. On the other hand the principle of local Updates of networked representations generates a time synchronized area which synchronizes time and space distant data. An isomorphous adaptation of the time, form and space states according to the human ability to differentiate is neither possible nor intended. The fascinating aspect of virtuality lies with the degrees of freedom which enablse the development of a separate parallel world. Space, time and experience demand new definitions within virtual dimensions. Simulation in the sense of mimicking generates copies of reality in dataspace. The extrapolation of models into the virtuality of digital worlds enables the possibility to generate autonomous model worlds beyond simple replicas. The core of the scientific interest is not the simple translation of our reality into virtual reality but the experimental research in the new digital worlds. Computer generated consciousness needs to be adapted to the human consciousness to enable communication between man and machine. Nevertheless virtual world views as mappings of artificial environments may differ significantly from traditional experiences. The extrapolation of artificial environments calls for the development of new context-sensitive structures which adapt the human horizon of perception to the artificial parallel worlds. These worlds as well as simulated model worlds of our reality will broaden our understanding of our universe. The huge amount of data generated by hypermedia is incomprehensible to the observer in its original binary form. Visualizing data and experimenting with visualized data worlds nowadays are the objective of scientific and artistic projects. Visual interpretations are subjected to qualitative criteria and cannot be objectified analytically. The change towards the visual therefore demands new scientific methods to get to grips with the broadened possibilities in visualization technologies through simulated model worlds. It is the cooperation of science and art as a joint-venture of different methods for the Interpretation of image-worlds which suggests itself. The extrapolation of the borders of the virtual by artistic experiments in dataspace and the scientific as well as epistemological formalization characterizes the transmethodological approach of the virtual space exploration. The research-paradigm follows from the extension of the classical tools with new media. Only new media cope with the tasks following from the exploration of real and virtual spaces. The gained experiences are influencing all fields of knowledge - science, society, art, and business - and are creating a new dimension. Connectivity - the magic word of the 90s - represents not only one of the Internet's main characteristics but also networked contacts, collaborations and Community activities. Since 1990 the debate surrounding the new media has formed the core of the Networking Community (-> www.inm.de) of the INM (Institute for New Media). This exchange is conducted by means of the World Wide Web Server, events, publications and exhibitions. The Networking Community is composed of the staff, scientists and artists of the INM, advisers, members of the cooperative pool/ fund and guests. The scientific, artistic and user-oriented discourse is sustained via continuous events at the INM. Symposia are held in the spring and the fall of every year, for example "Strategy of Appearance", "Feminism and Media", "Evolutionary Symmetry Theory", "Virtuality", "Visual Net Design", "Digital Spheres of Sound", "HyperSpaceTime". Since 1996 the Institute has been hosting the "Unplugged Heads" lecture series every Tuesday between 6 p.m. and 8 p.m. In this series of lectures which focuses on the new media, ideas are developed, projects are presented and new topics are discussed. Specialist Conferences, such äs "The Aesthetics of Science", "Psyche and Physis", "Data Research", the "Salon Vireal" series of events and various Workshops all foster for the debate with current themes regarding new media. The Institute's annual exhibition presents works which have been created within the INM for example "The Intrinsic World of the Apparatus World" (Frankfurt), "Viability, Variability, Vlrtuality" (Krems), "Art, Chaos, Media" (Sindelfingen), "L'esposizione impraticabile" (Frankfurt/Internet), and "World of VRML" (Frankfurt/Internet). Alongside its own activities the Institute also curates festivals and events and takes part in international exhibitions, conferences and symposia. The INM works in a networked fashion. 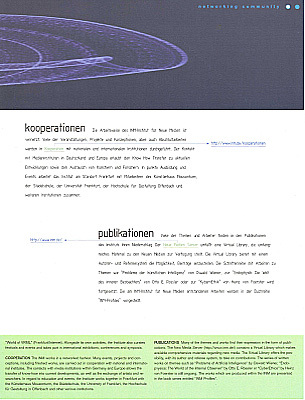 Many events, projects and conceptions, including finished works are carried out in cooperation (-> Kooperationen) with national and international institutes. The contacts with media institutions within Germany and Europe allow the transfer of know-how into current developments as well as the exchange of artists and researchers. In regard to education and events the Institute works together in Frankfurt with the Künstlerhaus Mousonturm, the Städelschule, the University of Frankfurt, the Hochschule für Gestaltung in Offenbach and other various institutions. 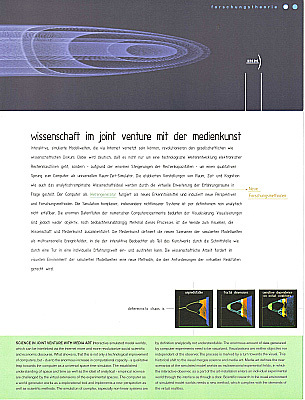 Many of the themes and works find their expression in the form of publications. The New Media Server (-> www.inm.de) contains a virtual library, which makes available comprehensive materials regarding new media. The virtual library offers the possibility with its author and referee System to take on contributions. 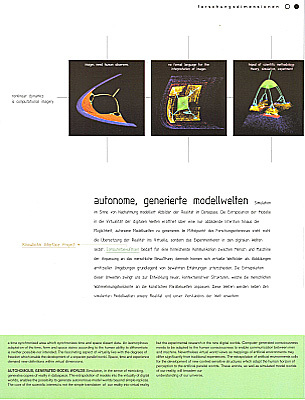 The series of written works on themes like "Problems of Artificial Intelligence" by Oswald Wiener, "Endophysics: The World of the Internal Observer" by Otto E. Rössler or "CyberEthics" by Heinz von Foerster is still ongoing. The works which are produced within the INM are presented in the book series entitled "INM Profiles". The INM's scientific and artistic consultancy unites researchers, theoreticians and artists. The advisers are not only renowned personalities but are also protagonists in terms of new media in their respective fields: Prof. Dr. Wolf Singer, Director of the MPI for Brain Research, Frankfurt; Prof. Dr. Gerhard Schmitt, Director of the CAAD Lab of the ETH, Zürich; Prof. Dr. Klaus Mainzer, Professor of Philosophy at the University of Augsburg; Prof. Dr. Gerd Folkers, Director of the Institute for Pharmaceutical Chemistry of the ETH, Zürich; Dr. Habil. Harald Atmanspacher, MPI Garching; Prof. Dr. Guido Bimberg, Professor of Musicology, College of Music, Dortmund; Prof. Kasper König, Rector of the Städelschule, Frankfurt; Prof. Peter Weibel, Institute Director of Visual Communication, HAK, Vienna; Prof. Dr. Wulf Herzogenrath, Director of the Kunsthalle, Bremen; Prof. Georg Herold, Sculptor and Professor at the Städelschule, Frankfurt; Prof. Thomas Bayrle, graphic and media artist, Professor at the Städelschule, Frankfurt. The INM is a gathering place for many visitors from around the world. Many take advantage of this opportunity to give lectures and guest readings or use the platform to work on their own projects. 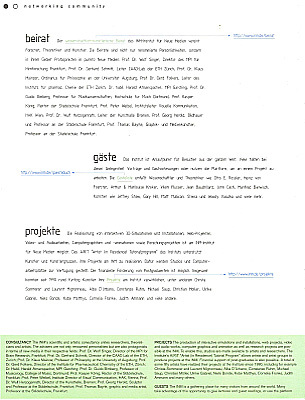 The list of guests consists of scientists and theoreticians including Otto E. Rössler, Heinz von Foerster, Arthur and Marilouise Kroker, Vilem Flusser, Jean Baudrillard, John Casti, and Manfred Bierwisch and artists including Jeffrey Shaw, Gary Hill, Matt Mullican, Steina and Woody Vasulka and many others. 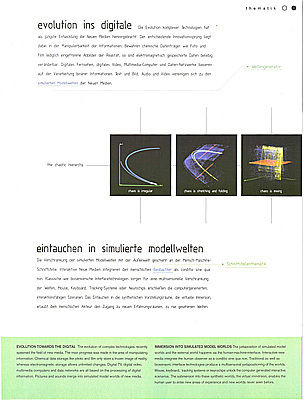 The production of interactive simulations and installations, web projects, video and audio works, computer graphics and animation as well as research projects are possible at the INM. To enable this studios are made available to artists and researchers. The Institute's A(R)T "Artist (in Residence) Tutorial Program" allows artists and artist groups to produce projects at the INM. Financial support of post-graduates is also possible. 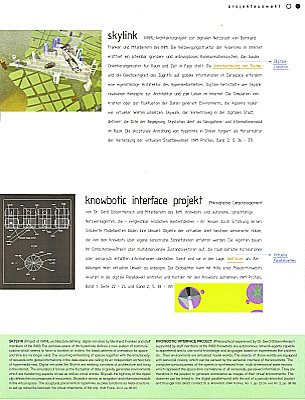 A total of some fifty artists have realized their projects at the institute since 1990 including for example Christa Sommerer and Laurent Mignonneau, Alba D'Urbano, Constanze Ruhm, Michael Saup, Christian Möller, Ulrike Gabriel, Niels Bonde, Kobe Matthys, Cornelia Franke, Judith Ammann and many others. The theoretical and experimental discourse at the institute about the opportunities afforded by new media leads to the development of the overarching concept of the interweaving of various worlds - vireality. The division into real and virtual systems does not allow in terms of the mediation of our environment an adequate perspective. Virtuality is not replacing reality nor is the real world being virtually doubled. The modification of our experiences, which we transfer from reality to vireality opens access to new dimensions. The concepts we have of spaces, objects and states are being expanded. Vireal objects and states (-> Virealität) are defined as real-virtual identities. An entanglement of real and virtual experiences with the interpretation of everyday objects, human actions and natural environments is becoming more and more self-evident. Are-thinking, which moves away from the dualistic "real and/or virtual" perspective and towards vireal objects, states and experiences, supports the future. The pool is both a shareholder pool of companies as a financial backup of the institute and a communication pool of the advisory board with members from politics, science, art, trade and industry, media and the INM-Forum. The pool itself also defines the platform of the discourse and the knowhow transfer. 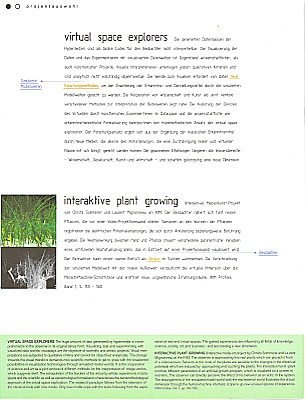 The creative dispute about actual topics of New Media, based upon Symposiums, exhibitions, publications, grants, world wide web forum and talks illustrate the active and interactive working method. Last but not least the "unplugged heads", brainstorming and free discussions, define our unconventional and creative access to the topics of New Media. The institute features a lean management organization built on flat hierarchies, teamwork and informal networking. In combination with our applied point of view the institute generates an attractive structure for the innovative and creative input and output. There are various solutions to realize the communication ideal as a discourse between science and art as well as the training concept for the innovation pool: symposia, workshops, grants, guest professors, third party projects, publications, internet forum, media-coaching, training, courses in New Media, development of protomodels, basic research, unplugged heads, talks, art and science project groups, cooperation, consulting, visions, studios and exhibitions. 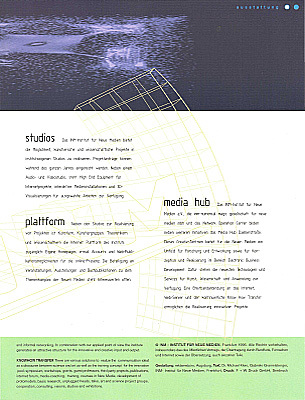 The institute for New Media was founded in 1989 as a subsidiary of the Städelschule, University of Fine Arts in Frankfurt. In 1994 it became autonomous andsince then is managed by a registered association. 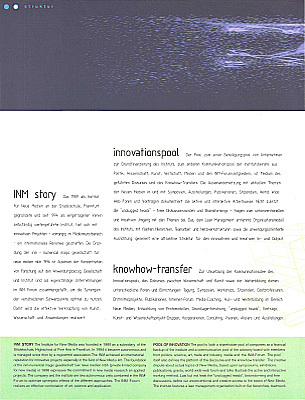 The INM achieved an international reputation for innovative projects especially in the field of New Media Art. 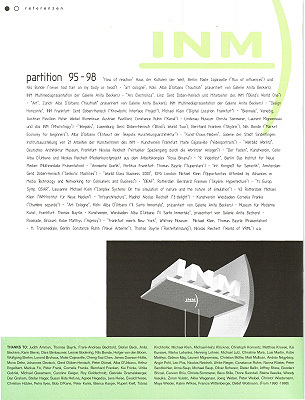 The foundation of the inm-numerical magic gesellschaft fuer neue medien mbh (private limited company for new media) in 1996 expresses the commitment in new media research on applied projects. The Company and the institute are two autonomous units combined in the INM-Forum to optimize synergetic effects of the different approaches. The INM-Forum realizes an effective combination of art, science and application. 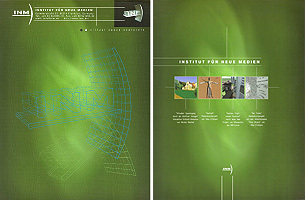 The INM-Institute for New Media offers the possibility to realize artistic and scientific projects in institute-owned studios. Project proposals can be hand in during the whole year. Besides an audio and a video studio there is high end equipment for internet projects, interactive media installations and 3D-visualisations for selected works available. In addition to the studios for the realisation of projects artists, artists groups, theoreticians and scientists can access the internet platform of the institute: own homepages, e-mail accounts and web publication possibilities for the online presence. The participation in events, exhibitions and book publications in the topics about New Media is open to interested people. 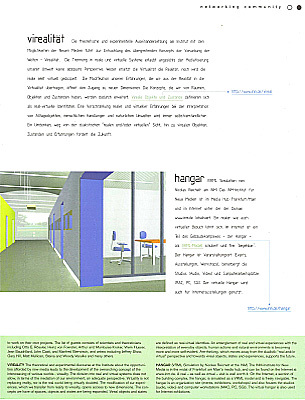 The INM-Institute for New Media e.V., the inm-numerical magic gesellschaft für neue medien mbh and the Network Operation Centre form in addition to further initiatives the Media Hub Daimlerstrasse. This creative centre offers an environment for research and development as well as for conception and realisation in the field of Electronic Business Development for the New Media . Therefore the latest technologies and services for art, science and application are available. A broadband connection to the internet, web-server and a continuous know-how transfer enable the realisation of innovative projects. 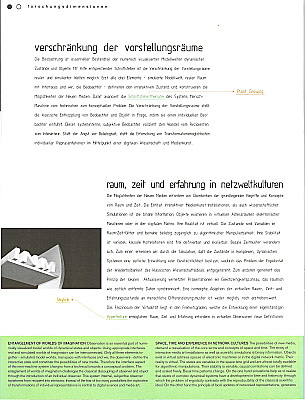 © INM - INSTITUTE FOR NEW MEDIA, Frankfurt 1996 / 1998. All rights reserved, especially the one of the public contract, broadcasting through radio, television and internet as well as the translation, even of several parts.